There is one thing very true when I think about cooking. The boundaries do not exist and there are always new cooking techniques or dishes to discover. Food enables you to travel because most of the time, the choice of ingredients are conditioned by the country or region’s climate. Travel, food? My best friends. Add to this a touch of foreign languages and it becomes even better and more interesting. Hence my love for Spanish, the language and the country. Not everyone is a fan of ceviche. As a matter of fact, I know a lot of people who just make faces when they hear about the possibility of eating raw fish. Du poisson cru? Yes raw fish indeed. However, I think most of those people should be told that the fish is actually somehow cooked. Although it is obvious that there is no heat source used, I describe the chemistry that happens between the fish and the lemon juice as a cooking process. The power of lemon juice! So strong! The chemistry offered by lemon juice enables the fish flesh to become firmer. Usually when fish is cooked with heat, the protein is “denatured“. The citric acid of the lemon juice has the same effect. So is it cooked? Raw? When I use the word cooked, P. always looks at me and says, “it is not cooked Béa!” to which I respond very quickly: mais si, c’est cuit! (of course it is cooked). What does he know? 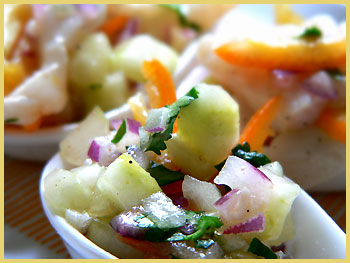 Whatever word we decide to use, I can only say this: ceviche is good. As a matter of fact, many of the guests I have served the following dish to did not even notice that the fish had not been cooked. It combined a beautiful blend of fresh flavours, enhanced by kumquats. 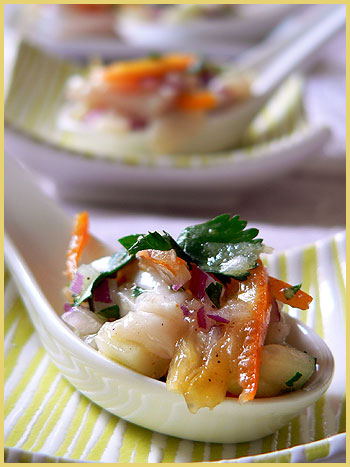 A few words about ceviche: Usually a speciality from South and Central America, particularly in Spanish speaking countries. The name comes from the Latin cibus (food) via Spanish cebo and cebiche (fish stew). A few words about kumquats: Surfindaave from Serendipitous Chef has a lot of good information for us here. I will summarize the following. Kumquats are miniature oranges, not bigger than 1.25 inches (3cm) across. Although you might think otherwise and as shown in this recipe, the rind is edible and tasty. Not like your average lime, lemon or orange rinds. Because the scallops are still somewhat raw, you simply need to make sure that they are extra fresh. Be careful, scallops need to show very little water, a sign of quality. In North America, the orange roe (coral) is discarded (to my regret) whereas in Europe, this part is also used. I found this recipe in the Boston Magazine but followed the proportions very loosely (lost the recipe so here you are, you just have to improvise). This is what I did. Take the scallops and slice them very thinly. Wash the kumquats and remove the seeds. Slice very thinly. Peel the cucumber, remove the seeds and cut in tiny pieces. Mix all 3 ingredients together and add a dash of lemon juice, salt and pepper. Place in a cold bowl in the fridge for about 10 mns. Chop very thinly the onion, the coriander and chives. Add to the scallops/kumquats/cucumber preparation. Add a dash of cayenne pepper and the olive oil, and mix well together. Serve in small spoons (appetizer spoons). Try, it is really nice! quel remarquable travail que de diffuser avec tant de talent la culture du savoir manger ! 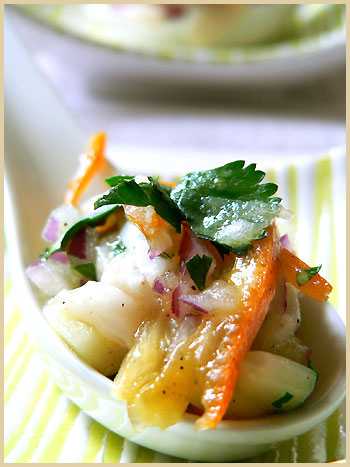 Amasing appetizer… fill with freshness and different textures! Too bad I can’t get good seafood in my area, so come to your place and drool allover. pourtant cette recette n’est pas toujours photogénique, tu en as fait une merveille. J’aime bien cette presentation en petites cuilleres. Tu me donnes envie d’essayer, j’en ai goute une fois mais il n’etait pas reussi. Et tu as raison, le poisson marine au jus de citron est cuit, rien a voir avec les sashimi ou sushi. Ohhhhh Bea, sure i will try, it looks light and refreshing! I love raw fish, although Ceviche is probably between cooked and uncooked. It has such a simple yet complex sensibility. My favourite is Belly tuna which is gaining popularity here in London. what an amazing amuse bouche bea. got no internet of my own been practising my pidgin french here. Ez, merci! 😉 Quand l’estomac parle, il me donne des ailes! Gattina, ah poor you, no fresh seafoos where you are? Anne, Sophie et Gracianne, merci bien. Et j’ai tout mangé! Ben tu m’expliques? je ne comprends pas…. Sha, yes I know. I miss the coral tremendously!!! Yeah, I usually make a face when I hear or see ceviche too. The face of a drooling halfwit as I slobber over it. Mmmm a spoonful of pure pleasure, yum yum! Absolutely lovely Bea… and hey! Anybody starts talking about raw fish and I’m all ears!! I love raw scallop sushi especially. That stuff just rocks! Your foodography photos are simply stunning. I really give you credit for being so involved in these events. Great stuff to read about! I am a very big fan! I love it. And I really love the addition of kumquats. Very original! a ‘dish’ with kumquats.. how cool! I live in the east coast of America. The place I live don’t have fresh seafood supplies (the one good enough for sushi)… most fish sold at supermarket is previously frozen, and not much choice either.